Like many, many, others I have stretch marks - apparently they will affect up to 75 percent of women at some point or other. A pretty high statistic and the causes are just as plentiful: weight gain, weight loss, genetics and of course pregnancy. The good news is that if you do suffer from stretch marks, you are of course not alone and there are various treatments and products to reduce visibility and improve skin texture. The bad news? I have yet to see any real evidence of permanent removal of stretch marks, and this includes the more surgical approaches. First of all let me explain what stretch marks are; they are the result of the skin suddenly stretching rapidly, almost without warning. As a result the middle layer of skin (dermis) fractures in places, allowing the deeper layers of the dermis to shine through, thus creating those pesky red come purple lines on the body. Yes to a degree stretch marks may look and feel like scar tissue but as they are not technically a scar, traditional laser scar removal procedures aren't entirely effective. I have seen improvement within stretch marks when treated with a laser in terms of texture, they somewhat flatten and lighten in colour but even after several intense sessions they are not completely eradicated. If you do decide on such procedure, it is recommended you do so when the stretch marks are new and still red/purple in colour for best results. I should warn to prevent hard earned cash being wasted, that at best you will see an improvement of 50% and that such treatment is not suitable for certain skin tones. Like most beauty woes, prevention is better than a cure - trust me I know this is easier said than done, if it was simple I'd have far less marks than I do. So to prevent your best bet is to be vigilant in moisturising problem areas (tummy, hips, breasts, thighs and upper arms), the more intense said moisturiser is the better. The reasoning being that if the skin is hydrated and supple it will stretch without trauma and of course stretch marks. I find body oils to be the best bet, they penetrate the layers of the skin more effectively and dare I say quickly too. My top tip is to look for a dry oil as they are non-greasy, quickly absorbed yet deliver all the same results as a traditional oil. Despite what I have just said, I personally use Bio-Oil which is a tad greasy. My reasoning is that I find it not only prevents new marks from forming but helps to some what fade any existing lines. It also doesn't hurt to hydrate from the inside out - aim to drink your daily water quota to aid skin renewal and keep it supple. If you do find that your stretch marks are raised, you can exfolaite, again the more frequently you do so the better the results. How you exfoliate is up to you, the idea is to encourage the top layer of skin to regenerate naturally, for smoother, plumper skin. I rely on the dry brushing technique which is great for two reasons: it helps combat cellulite and lymph drainage to boot and once you own a brush you don't have to shell out on body scrubs constantly. I'd also like to add that my skin has never been softer and my self tanning never as even as it is now since switching over. Let's end on a high shall we? No you can't permanently remove stretch marks, well not yet at least but do keep in mind technology is forever changing, who is to say that in a few years that it won't be on the agenda. The other thing to keep in mind is that more people have stretch marks than those who do not, you certainly aren't alone. I mentioned above how to treat and prevent but Vichy Dermablend Foundation is King, with Sally Hansen Air Brush Legs a close second at covering the pesky blighters, should you ever need the confidence boost. I am absolutely covered in stretchmarks now and although I know it's all for a good cause, I can't stand looking at them right now. I've moisturised and oiled all the way through my pregnancy but I'm destined to have them unfortunately :( may think about laser if they don't fade further down the line but will try the exfoliation method first! I find the quicker you get in with lotions and oils as soon as you see scars/stretch marks, etc. appearing the higher the chance you have of minimising the appearance of them. that's what I've found anyway ! I didn't anticipate getting stretch marks. I got them on my legs and didn't notice them for a while. I think I grew tall so quickly I must have gotten them then but to be honest they don't bother me! 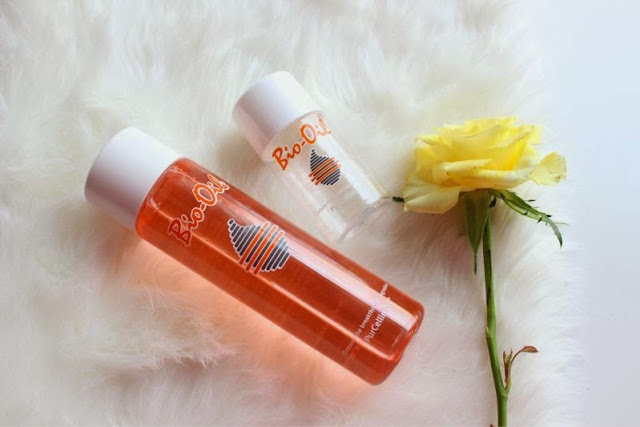 I do love bio oil for moisturising my skin though!